This interview has been edited and condensed. Unless otherwise noted, Fabraz responses are provided by Fabian Rastorfer. On May 20-21, the Five Points Fest took place at Pier 36, at the southeast tip of Manhattan. The event promotes itself as a convention for toys and comics. One wonders why there would be a need for that outside of Comic Con, which is the prime comic convention in the Northeast. Particular about Five Points Fest, though, is its support of the counterculture of comics; it’s a forum for artists, creators, and toys which haven’t made it to big-name-brand-status. Somewhere in that crowd of revolutionaries, we found a familiar trio who set up their stand to show off their indie video game title. The trio consisted of Fabian Rastorfer, Ben Miller, and Edgar Castro, the makers of the platformer Slime-san which launched on April 6. OPN had an opportunity to speak with the developers at length about their continuing work with Slime-san. Their answers show inside-track glimpses of the challenges and expectations of indie studios who seek to maintain and expand a title after release. Scavone: Could you tell us a little bit about the history of Fabraz leading up to the development of Slime-san? You guys are a fairly young studio, right? Rastorfer: We officially filed a company, I believe, two-and-a-half years ago — plus, minus. We originally met back at Parsons; when we were studying there, we were going to the same Game Design 101 class. We noticed that we worked really well together and decided to create a game. Right after graduation, we started the company together and have been working on games ever since. Was it scary to found a company? It wasn't as scary as it should have been, I think. There was always the enthusiasm that I really wanted to do it. During university, my thoughts already went past graduation: I want to start my business, I want to start making games. I guess, I personally was never much of the academic type. You had two titles before Slime-san. How was the launch of Slime-san for you in comparison to the other titles? Were you able to stay on schedule? How was the reception? Did it go as expected? What's cool is that it went really well. It definitely hit all the expectations and hopes that we had. Just to compare numbers of players, our previous game had around 25,000 players, while the number of players for Slime-san hovers more around 100,000, 105,000, so that's like four times as many. We worked toward a very hard deadline. We had the deal with Humble Bundle to be part of the Humble Monthly Debut Title. That was a hard deadline that we had to keep and we managed. I also have to say, I'm quite satisfied to say that we managed without any sacrifices. We were worried for a while that the five mini-games that are in the game would have to be cut or partially cut, but no, none of that happened. Slime-san did well enough for us to now continue doing the console ports and content patches and so on. How was the reception of Slime-san after the launch? I believe we're hovering around 85% - 90% positive rating on Steam--really nice and high. Reviews are always around four to five stars. People have been really digging it. What's awesome is seeing some of our superfans. We have a couple of people who are really competitive in the leaderboards and who put in two-hundred-plus hours, to the point where now other players know of their name and go, "Oh I'm gonna now beat nitro, I'm going to beat YOSUMIN." Those are the two big ones, for example. Miller: [nitro] comes up a lot in Let's Plays. There are entire episodes named after him because he became just so ubiquitous. Did the launch go as expected? Were you afraid that it would not take off? Right now the market is a really difficult one. It's been a really good year for the consumer, but it's been a difficult year for the producers. Consumers got a ton of really good new indie games in the last two months: a ton of really good AAA games from Japan — which is interesting. That also means that there is a lot of competition to work with. There is also that (feeling) that you are going to fly under-the-radar. I don't think we had (a) gigantic breakout success, but I do think that we have gotten to the point where a big chunk of people on Steam and Twitter know of the name Slime-san, and that is, on its own, a really cool accomplishment. What makes Slime-san unique compared to your other titles? We genre-skip a lot. So, I'd say they're completely different — each and every one of them. Our first game [Cannon Crasha] was a strategy title. The one before Slime-san [Planet Diver] was an innovative take on an endless runner and (Slime-san) is a take on the platformer genre. What was the feedback from gamers after you launched Slime-san? Pretty good. We made some hotfixes the first two weeks after launch. They were usually very platform-specific issues, like a certain graphics card that would lead to an issue, or an antivirus that would lead to a weird lag — really interesting things. Miller: That was a fun one. Rastorfer: Really bizarre to find. Actually, our userbase figured it out themselves, luckily, because I don't think we would have figured that out. There was an antivirus program that interfered with Slime-san? That's right, but only with one certain move in the game; it was very bizarre. Then, we also started to address small suggestions that people had. For example, there were a couple, not many, who were saying that the colors in the game gave them eye strain. Now, for example, we are working on a patch that's going to have a toggle in the visual settings that mutes the colors a little bit so that they are a little less strenuous on the eyes. But overall, when it comes to the major mechanics, people seem to just dig 'em. What would you say are the main tasks in maintaining Slime-san? Content patches, hotfixes to address small issues on specific platforms. I think it's also useful to make speedrunners feel like they are getting the attention they deserve. They do speedrunning partially for that reason, so I think there is also a lot of marketing you can do online to help them out a little bit; promote the user base, not just the game. So that's some maintenance there. Then, just to maintain interest, we are teasing toward the content patch now. You are currently working on porting Slime-san to consoles. Can you tell us more about that? 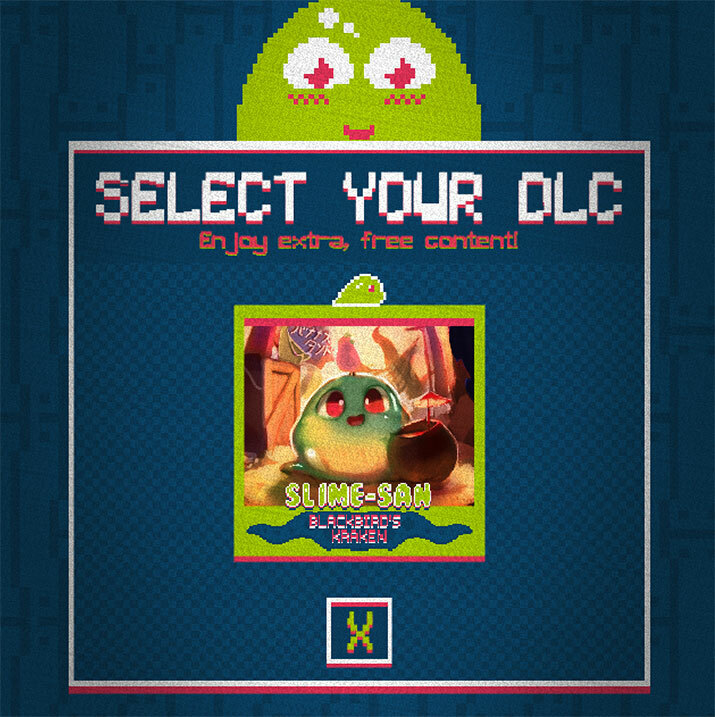 We are really excited to say that we just submitted Slime-san to Lotcheck for Nintendo QA. Nintendo Switch is the first console we are going to be launching on, hopefully within the next month or two. That has been going really smoothly. We did that completely in-house. Then, our publishers are doing the ports for us for the PS4 and Xbox One. The publishers do all the work for the porting to PS4 and Xbox One? Yes, basically they [Headup Games] do most of the work… they have an internal team for porting, which is awesome, because that's very time intensive. The administrative part also takes a lot of time. Do you have an idea about how the porting to console will change the player base or popularity of Slime-san? What opportunities do you see for Slime-san on a console? I think it's a very different market. One of the driving parts of Slime-san is our speedrunning community and the leaderboard. I think that's primarily still going to be driven by the PC market and not by console. The console version is more likely going to be for the casual consumer. Of course, when it comes to patching, on Steam we can (patch) whenever we want: if we want to submit a patch today, we can do that. But on consoles, there is going to be a process to it. So, patching is probably going to be a little slower. That will include content patches. Especially the big content patch we are working on right now called, Blackbird's Kraken, is only going to release on Xbox for a certain period of time before PS4. What can you tell us about Blackbird’s Kraken? Blackbird’s Kraken is our first content patch which we are excited about. It's going to boost the content of Slime-san by 30%. It's a huge chunk of new content. It's going to have twenty-five levels, then another twenty-five New Game+ levels, as usual, a speedrunning specific mode just for the DLC, a unique boss, unique mechanics, including a submarine and bouncy bubbles, that kind of stuff — think aquatic themes. The storyline is that Slime-san has finally escaped the worm and has to take some well-deserved holiday with his family. So, they go on a raft, and they go to the Caribbean, essentially. Along the way, Black Bird sees them and thinks they are going there to steal his treasure and so he summons his Kraken. Lo and behold, Slime-san and his family get swallowed by the Kraken and once again you have to escape its innards before getting digested. (Also) it has a new hub world, a little island where you can spend bananas instead of apples to buy furniture and customize your house. What theme does the hub world on the island have? When would you consider your work on Slime-san done? When we don't have a user base anymore that wants more content, I'd say. As long as we have a player base that consistently still plays the game and wants more content, we'll work on giving them that. Are you currently working on new projects? We aren't quite working on them, but we are certainly prototyping them. In fact, when you were walking in just now, we were talking about it. I can't go quite into details, yet, because this might be a prototype that never comes to fruition, but we definitely have at least two things we want to prototype to see if we make that our next title. That usually means that we spend a month to create a tiny little demo and if that demo works for us, if it works for other people when we show it to them, then we continue working on it. So, you have test players? Miller: Yeah, that's kind of how Slime-san also started. We spent a month just making the basics of a level or two, just getting the feel down. What are some lessons learned from your work on Slime-san? I think the biggest, for all of us, would be tutorials. Also, thinking back to your question (about) how Slime-san is different from the other games — I think that's maybe the most notable thing in terms of our inner workings. We got much better about explaining in the game, and getting the player eased in without them necessarily realizing. With Slime-san, we redesigned the first five levels a dozen or more times just trying to... seamlessly (teach) the player the movements, the mechanics, the ins-and-outs of the game. I'd also extend it to menu navigation. We've gotten way better at using the gamepad for menu navigation, for example, not relying on a mouse or touch screen controls or anything like that. This is our first game that we will be porting to console. Our previous game was PC, so we always had the mouse as the way you could navigate the menu instead, and here we had to make sure that we don’t rely on that — only as an additional option, but not a necessity. I think that steered a lot of our design when it comes to menu design, and that will stay with the rest of the game. We thank Fabraz for talking to us and letting us partake in their journey with Slime-san. The adventure has just begun and will go on for a long time with the wisdom gained from the hurdles which have been cleared. In this sense, we hope that Fabraz’s example inspires other indie developers to take the plunge and turn their passions into their jobs.